R&D expenditures increased according to the preliminary statistics by the National Documentation Centre. According to the preliminary statistics published by the National Documentation Centre (EKT) and transmitted to Eurostat, the percentage of GDP for R&D expenditure in 2017 reached 1.14%. R&D indicators are published annually by EKT, the designated National Authority of the Hellenic Statistical System for the production of the national official statistics for Research, Development and Innovation. Significantly, continuing its upward trend of recent years, 2017 R&D expenditure in Greece reached 2,033 million euro, a sum that is 15.9% higher than 2016. Similarly, the R&D Intensity indicator, representing R&D expenditure as a percentage of GDP, rose by 0.13 percentage points, reaching 1.14% from 1.01% in 2016. This stands as a new all-time high. Based on this, Greece ranks 19th among the EU28 member states along with Ireland and Spain. EKT’s nationwide R&D survey was carried out in 2018, in line with the updated version of the Frascati manual (2015): “Guidelines for Collecting and Reporting Data on research and Experimental Development, The Measurement of Scientific, Technological and Innovation Activities”. 3,500 organizations were surveyed from the following four sectors: business (BES), higher education (HES), government (GOV) and private and non-profit (PNP). BES is, for the second consecutive year, the largest contributor to national R&D expenditure. Indeed, BES R&D expenditure has been rising steadily in recent years (showing a 33.8% increase between 2017 and 2016 and 31.8% between 2016 and 2015). In 2017 and in absolute terms, BES R&D expenditures were just below a billion euros (990.8 million euros), constituting 0.56% of the GDP. Interestingly, an increase is observed across all business size classes, in both the ‘‘traditional’’ manufacturing sectors, such as pharmaceuticals, food and beverages, chemicals, refined petroleum, metallic products, as well as the ICT (telecommunications, computer programming) and more service-oriented sectors, such as the financial sector. It also includes enterprises with significant investment projects, including national infrastructure projects. An increase in R&D expenditure was also recorded for the three remaining sectors. In HES, the sum stands at 577.7 million euro (0.32% of GDP), indicating a 3.3% increase in comparison to 2016. In GOV, expenditure rose to 448.1 million euro (0.25% of GDP), a 2.1% increase in relation to 2016. PNP contributed 16.4 million euros in R&D, a 0.01% of GDP, increasing 5.1% in comparison with 2016. In terms of funding sources for R&D in 2017, the largest amount, 910.6 million euros (44.8% of the total), originated from businesses. The majority of this sum, 834.3 million euros, was invested in R&D activities carried out by the businesses themselves. The remaining amount funded R&D activities in HES (48.1 million euro), GOV (25.2 million euro) and PNP (3.0 million euro). Government funding (which includes the Ordinary Budget, Public Investment Programme, NSRF 2014-2020) amounted to 772.7 euros (38.0% of the total). This funding constitutes the main R&D funding source for both HES and GOV. In relation to 2016, the Ordinary Budget increased by 43.9 million euros,and the Public Investment Programme by 3.5 million euros. European funding stands as the third largest R&D funding source, also showing an upward trend in recent years. In 2017, it amounted to 215.1 million euros (10.6% of the total). The EU has been funding research projects in all sectors, particularly through Horizon 2020, in which Greek organisations have gained a considerable participation rate. A significant increase was recorded in private R&D investments coming from abroad in companies operating in Greece. It amounted to 55.8 million euros in 2017 from 25.2 million euro in 2016, an increase of 121.4%. The statistics and indicators for Research, Development and Innovation in Greece are produced by EKT and regularly transmitted to Eurostat and the OECD. 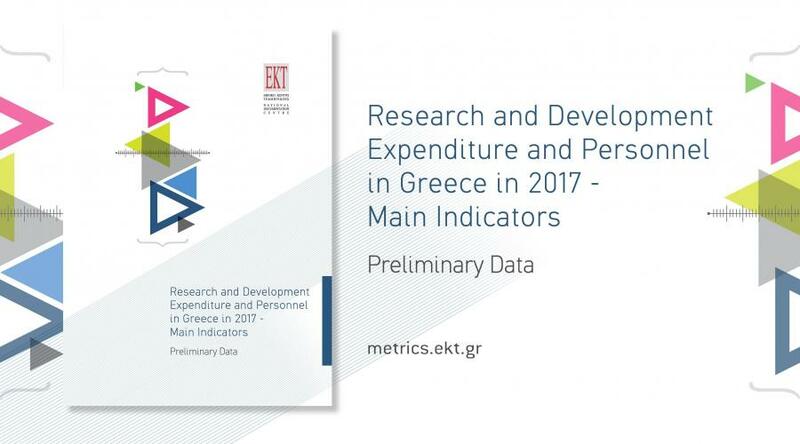 Data analysis and the relevant indicators are published by EKT and are available at http://metrics.ekt.gr.